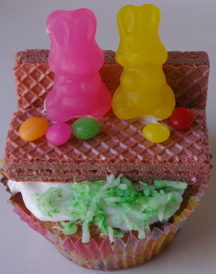 Snip up a marshmallow to make this sweet Easter bunny cupcake. 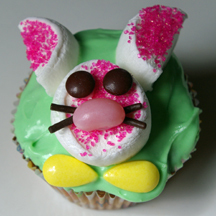 What You Need: 1 cupcake; green frosting (or any color except white); 1 marshmallow; pink sugar; chocolate sprinkles; brown mini M&Ms; pink jellybean; 2 tear-shaped or heart-shaped candies for bow tie (ours are Cry Baby candies); kitchen shears or regular scissors. How to Make It: Frost cupcake. using shears or scissors, cut marshmallow in half down the middle (long) side. Your scissors will get sticky, so if you’re doing a lot, you’ll need to clean them off or perhaps try spraying them with cooking spray before cutting. Cut one of the marshmallow halves into two half-circles. Dip sticky sides in pink sugar as shown. Position face and ears on cupcake. 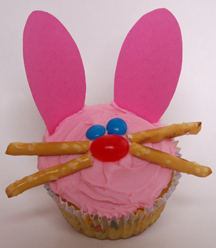 Use dabs of icing to attach M&M eyes, jellybean nose and chocolate sprinkle whiskers. Arrange tear-shaped candies below head to form bow tie. 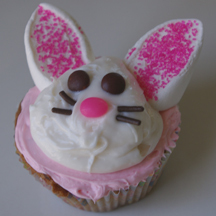 This sweet Easter bunny cupcake is my twist on a design by Betty Crocker. I just use whatever candies I have on hand, which cuts down on costs and trips to the store. What You Need: 1 cupcake; pink frosting (I just used strawberry in a can); white frosting; 1 marshmallow; 2 brown mini M&Ms; 1 small pink candy or jellybean; chocolate sprinkles; pink sugar. 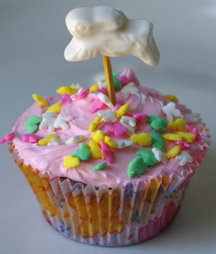 How to Make It: Frost cupcake pink. Drop a scoop (for uniform size, use a cookie scoop, melon baller or similar implement) of white frosting in center of cupcake. Cut marshmallow in half crosswise. Dip sticky part in pink sugar. Stick into back of white frosting for ears. Add eyes and nose. Choose longest sprinkles for whiskers.